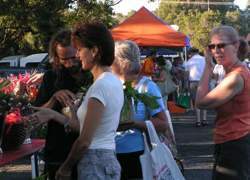 The Byron Bay Farmers Market is becoming well established in and around the region. 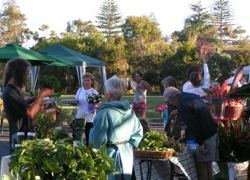 At one of the many local Farmers Markets, the customers can chat to the farmers directly about the produce and farming methods that they have used. 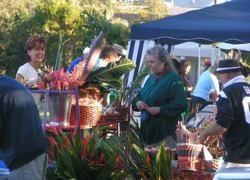 Some of the market stalls are incorporated into the weekend markets, but there are also regular separate week day stalls scattered throughout the region. The produce changes with the seasons, but there are some staples that are available year round including: sugar cane juice freshly juiced on site, macadamia nuts - (muesli, oils and spreads), smoked fish and prawns farmed in Ballina River, prime cuts of beef, locally made bacon & sausages, organically grown turkeys, chickens & their eggs, coffee, breads, olives, honey, pestos, marinade, dressings, jams & chutneys, sprouted seeds & nuts, fresh squeezed wheat grass as well as fresh flowers, fruits, vegetables herbs & spices. Everything is always fresh and well priced. 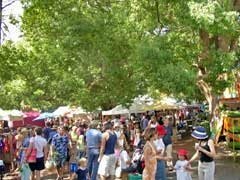 Another great way to pick up fresh produce is on country drives - look out for the roadside stalls, where fresh fruit and veggies are sold direct at the farm gate. Most markets run from approx. 8am to 11am. If you have any updates to the above information, such as new markets starting up, changes to times and dates of existing markets or change of contact details and phone numbers - or for any other matter, we'd love to hear from you.